Hello everyone! It's time for another sketch. Don't be afraid of the slight business of the sketch. It's actually very easy to make it extremely clean and simple! Here's the sketch: And here's my card. Since there's been a certain paper sale on this month (the SU! buy 3 get 1), I figure I should try to make use of more of my patterned paper stash. 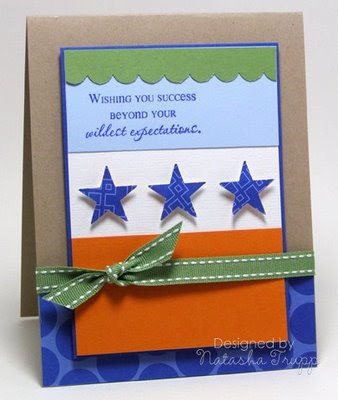 For this card, I chose one pack- I think it's Jersey Shore and used that as my colour scheme. Typical card base 4-1/4x5-1/2 find this sketch works a bit better if you do a top fold. The card is quite simple. 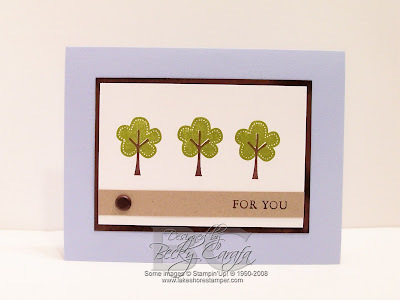 I stamped and cut out the tree, then arranged the papers as I had sketched out, and added a greeting. As always, feel free to leave a link to your card in the comments! Happy Victoria Day to my fellow Canadians! Because of the holiday, I completely forgot that today was Monday, I'm still on weekend mode. Never fear, I have a few cards to share. 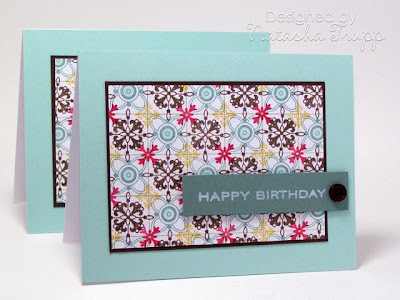 I've been having fun making patterned papers with the Guidelines stamp set from Papertrey Ink. If you decide on the specific images and colours before hand, a background can come together very quickly. 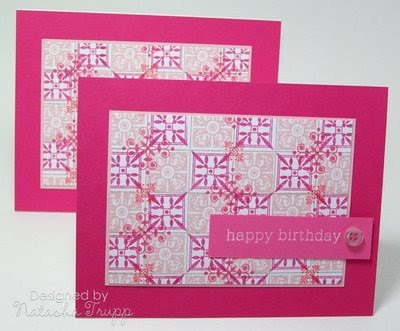 I like to stamp a larger piece, then use it on a few cards. 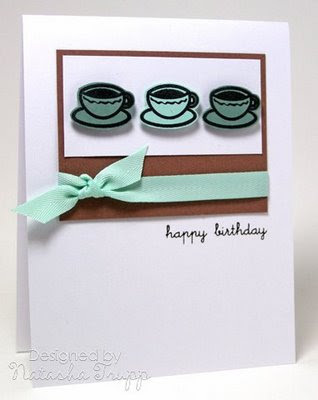 The colour palette on the first group of cards was inspired by Niki Estes. 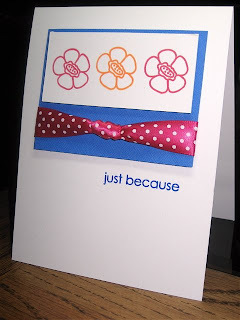 For the second group of cards, I wanted something that definitely said feminine, as cliched as that is, I went with pinks. 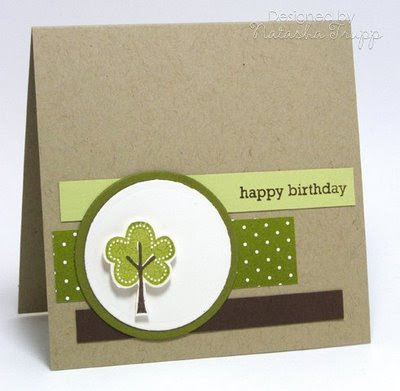 I haven't been stamping in two weeks since I've had a hip replacement - and I was having a bit of trouble getting back into making cards. So this sketch combined with Dawn McVey's Raspberry Suite Color Challenge got me started. 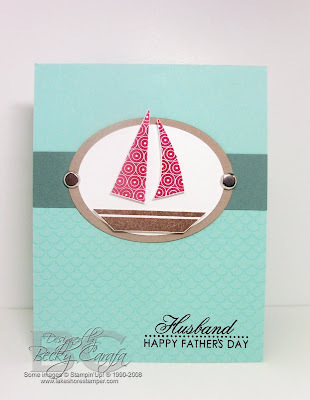 It felt great to get back to card making! I stamped the umbrellas onto the white paper, then stamped them again and cut them out and adhered them to the image panel with dimensionals. I added the flower for balance - it just looked funny without it. 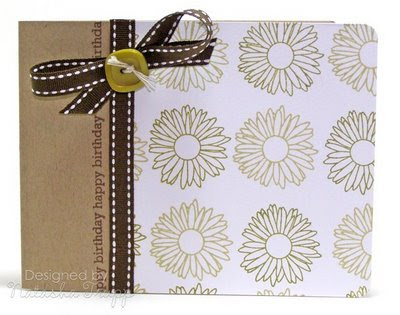 Supplies: Stamps - PTI ; Ink - PTI Berry Sorbet, Aquamist and Versamagic Jumbo Java; Paper - PTI Stampers Select, PTI Bitty Dot Basics, PTI Chocolate Brown; Misc - May Arts Satin Ribbon, Fiskars Threading Water Border punch, Prima Flower, half back pearl, dimensionals. Ready for another sketch? This sketch is based off of a card I made almost a month ago. Although it's not ultra simple, I really like the linear design and the proportions. I made three versions, this yellow one, a pink one, and a blue one. 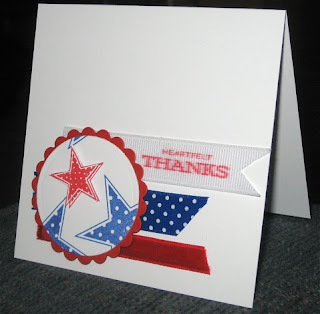 I love using clear sheets as my card base and I especially love adding a cool background with white stazon. I did a bit of rock'n'rolling for the flowers. I really love mixing lemon tart with just a touch of summer sunrise around the edges. 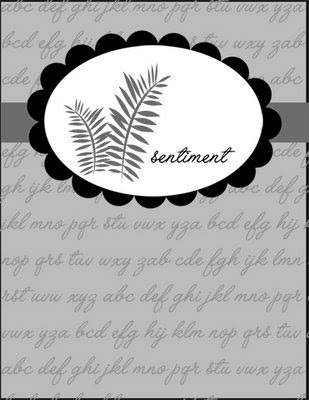 Optional interior or back piece: 3.75x5. As always, if you play along, feel free to leave a comment with a link! Today's card is one that was completely inspired by the fabulous Heather Pulvirenti. She has such a fun style, lots of good CAS cards, lots of very detailed and more complex stuff too (something for everyone!) 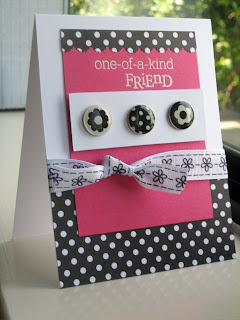 When I saw that card, I just loved it and so I filed it into my "Inspiration" folder. If you have a ridiculously large hard-drive, this is something you might want to consider doing. If I see something I really like, I save it to an Inspiration folder. These photos go nowhere, I would never post them online! In some cases, what people post sometimes gets taken down for a publication, this way you still have it. They are there whenever I need a little creative boost. This is also another reason why I love it when people have watermarks. If I'm inspired by something months old, I can give credit where credit is due. So here's the card, I went with a different orientation, a different floral image, and a different colour scheme, but I think it's apparent how the original card inspired me. I made this card a few weeks ago, but now that I'm focusing on it, I kind of what to make a few more in different colours! Accessories, etc. : Saddle Stitched Grosgrain, twine, button from who knows where, but it matches Ripe Avocado perfectly! The brown rectangle piece is 2.5x3-3/8. The small white piece is 1.5x 3-1/8. The items are approximately 1 inch each. I have two cards again today to share. 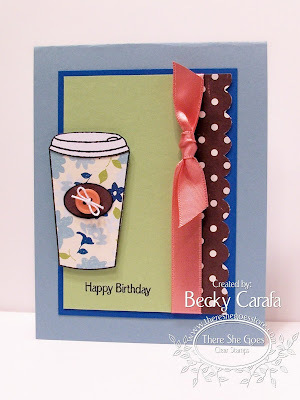 The SCS CAS challenge was posted last night and it is a sketch - so many possibilities! 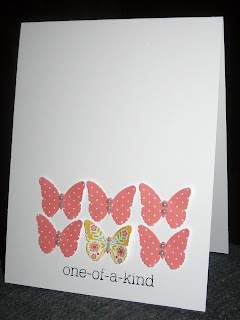 The first card uses some of my favorite things: MS Butterfly punch, Urban Prairie paper and pearls. The sentiment is from PaperTrey's Friends Til the End set. 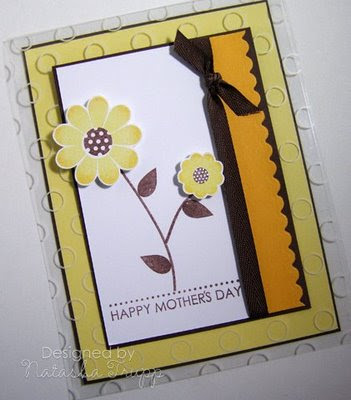 The second card is also a quick one layer card. 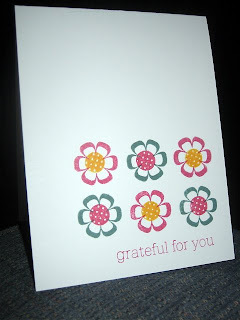 I used Verve's Petals and Stems to make the flowers using PaperTrey's Raspberry Fizz, Summer Sunrise and Ocean Tides inks. The sentiment is also from Friends Til the End set. 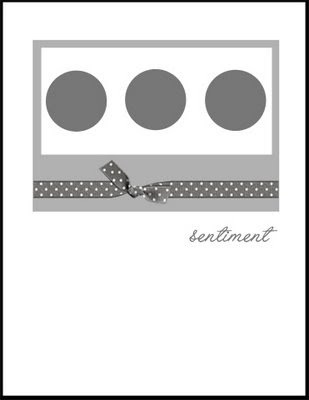 Supplies: Stamps - Verve, PaperTrey; Ink - Versafine Onyx Black, PaperTrey Perfect Match; Paper - PaperTrey, Basic Grey Urban Prairie; Misc - MS punch, pearls. 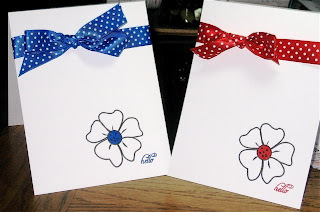 I have two cards to share using today's sketch. 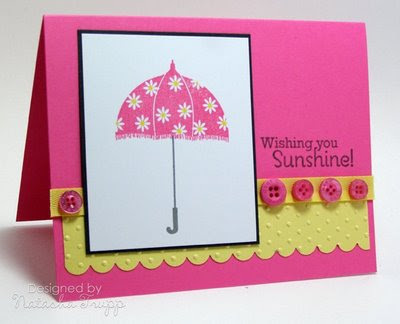 Both are using the : Raspberry Suite Color Challenge #4 here on Dawn McVey's blog. 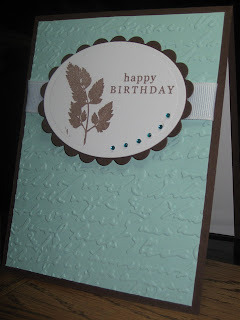 On the first card I used the script CB embossing foldeer on the Aqua Mist background and on the second card I used French Script background stamp from Hero Arts in Aqua Mist ink. 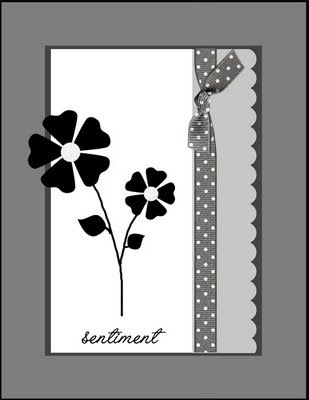 The image on the first card is from Rubbernecker - Jeanne Streiff collection and the sentiment is from PaperTrey Limitless labels. 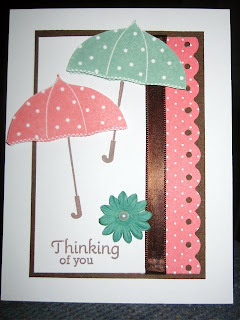 On the second card I used the images and sentiment from PaperTrey's A Pond Life. I also sponged the oval with aqua mist. 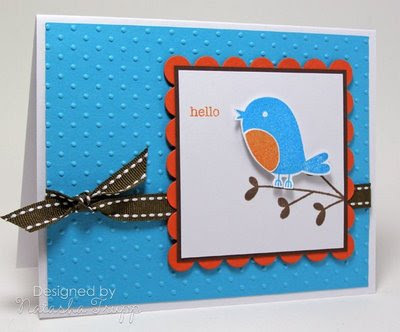 Supplies: Stamps - Rubbernecker, PaperTrey; Ink - PaperTrey Aqua Mist, Memento Rich Cocoa; Paper - PaperTrey White Stampers Select, Aqua Mist, Dark Chocolate; Misc - Nestabilities, Ribbon, Amuse Micro Twinklers, Cuttlebug Embossing Folder, Dimensionals. Wow! I can't believe it's been 40 sketches already! I know I've said this before about other sketches, but this layout is so much of a "fall-to" for me, that I had to double check all the previous sketches to make sure I hadn't done it yet! 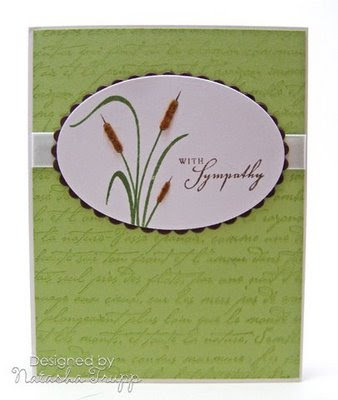 I find that the clean and simple style is best for sympathy cards. 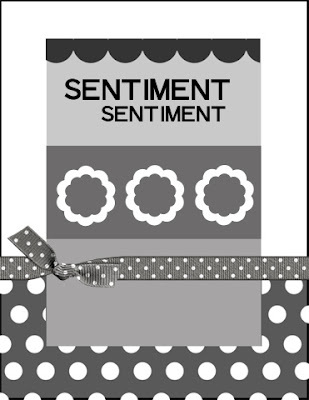 The last thing I want to be doing is spending a large quantity of time on a sympathy card. I want it to look pleasing, comforting, and simple. 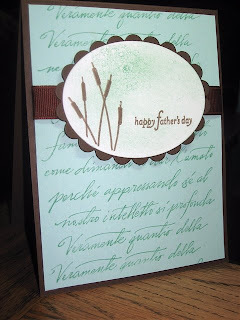 To add a little bit of extra to the card, I used satin ribbon and I added flocking to the cattails. 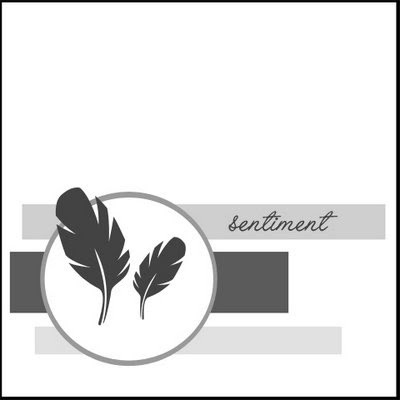 In general, I find that nature imagery, scallops, script, and satin or organdy ribbon are good choices for cards that are more somber in nature. If you play along, feel free to leave a comment with your link!